Since Halloween fell on a Sunday in 2010, we didn't want the children to feel that they were missing out on the fun their friends were having by being given a traditional All Saints/Festival of Light church service. We looked at ways of exploring the themes of dark and light and good and evil. As my 8-year old commented, you can't have light if there is no dark, and there would be no such thing as good if there was no evil as well. In their everyday lives children face sadness and happiness, joy and despair, kindness and malice, love and hurt, and sometimes life and death. It is important to acknowledge these different shades and emotions in order to help children to cope with them when they experience them in their journey through the world. So, we invited children to a "Goodies and Baddies" party. 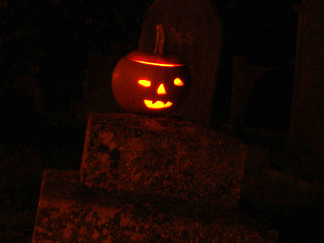 They arrived dressed as their favourite heroes or villains, carrying pumpkin lanterns and torches. In three rooms upstairs, they were set a range of challenges, with sweets as a reward. Downstairs children were tempted by me (dressed as a devil with a snake round my neck) to bob for apples in a bowl of water, and then try to get a sweet out of a tray of flour without using their hands. The end result was a set of symbolically white faces! A series of tables was arranged around the apple bobbing with a range of crafts which would be incorporated in worship later. These included decorating: glass candle holders with glass pens and small adhesive jewels; white cotton sashes with fabric pens and adhesive large jewels; card crowns with sequins and symbols of Christ; shields with cut-out flames, doves, sheep, crosses or fish and embellishing them with gel pens and sparkly bits. After that we all gathered downstairs to share food and drink, including icing and decorating gingerbread goodies and baddies. We then collected up torches and lanterns and everything that had been made during the party and turned out the lights. We processed in silence (or near silence!) through the churchyard, following a path of candles and into the back of the church and around the font. The children were invited to take off their scary masks and put on the 'armour of light' that they had made earlier: sashes, crowns and shields. A spotlight came on in the East end of the church, and a Christ figure said "I am the light of the world"
The children were invited to come down to the front following the candles, and singing 'Oh when the Saints go marching in'. We gathered around the altar for praise songs. There was then a brief address which used clips from Star Wars following Darth Vadar's journey from the evil of the dark side of the force to his choice to turn to good through the help of his son Luke, and final union with his fellow Jedis in the light of the force. It was emphasised that no one is so bad that they can't become good. During the prayers we turned to look at the darkness at the back of the church and thought about the things we had left behind, before turning towards the light at the front of the church and thinking about the future. Finally, we processed out of the church singing 'We are marching in the light of God', lighting the night lights we had made earlier from the Paschal candle, and taking them out to place on the graves around the church, as a sign that we will all join the company of heaven when we die, and live eternally in the light of God. 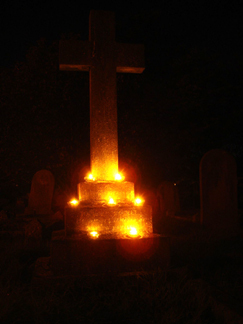 The whole churchyard was lit with spots of light.